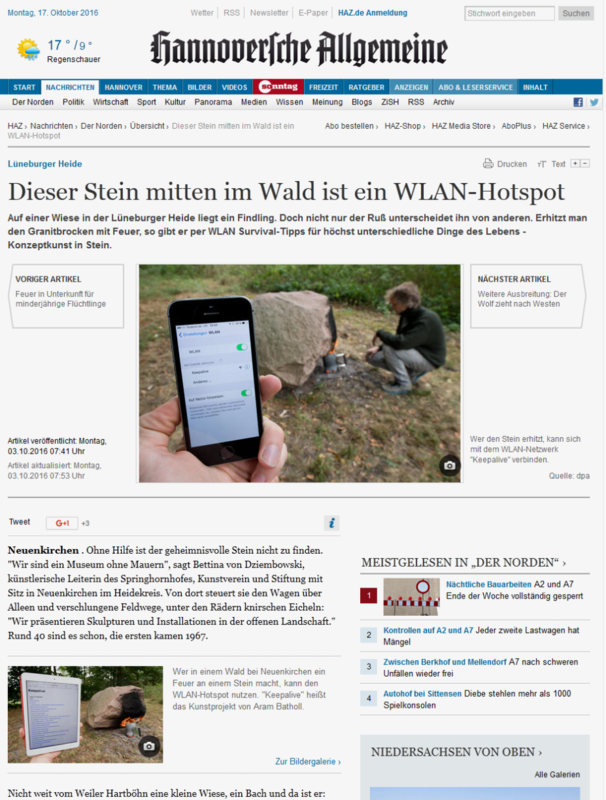 After a recent visit by a DPA reporter at Springhornhof museum, Neuenkirchen a series of articles about “Keepalive” came out in Germany. The boulder from the region Neuenkirchen, Niedersachsen contains a thermoelectric generator which converts heat directly into electricity. 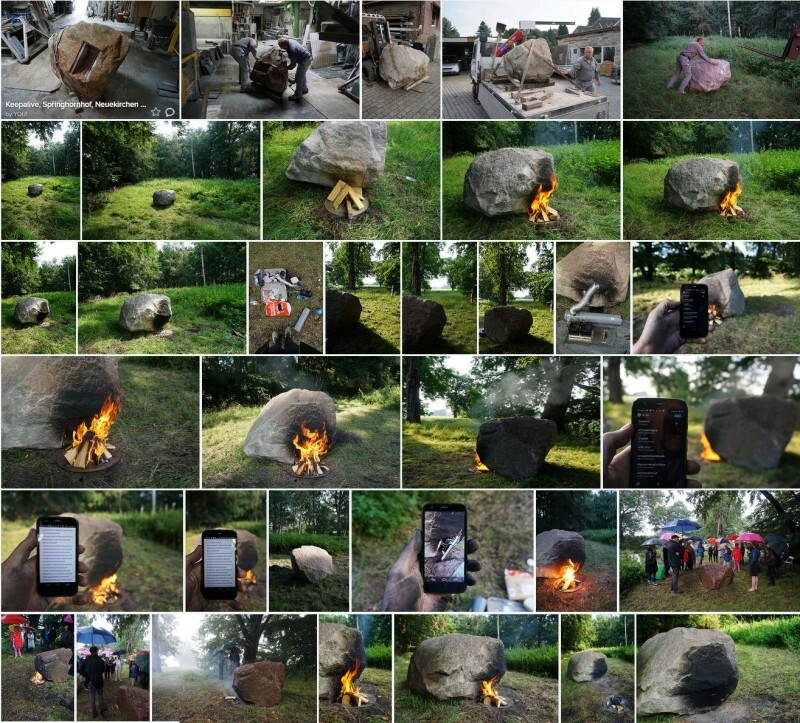 Visitors are invited to make a fire next to the boulder to power up the wifi router in the stone which then reveals a large collection of PDF survival guides. The piratebox.cc inspired router which is NOT connected to the Internet offers the users to download the guides and upload any content they like to the stone database . As long as the fire produces enough heat the router will stay switched on. The title Keepalive refers to a technical network condition where two network endpoints send each other ’empty’ keepalive messages to maintain the connection. https://en.wikipedia.org/wiki/Keepalive To visit the piece please arrange an appointment with Springhornhof.de. The project “Keepalive” by Aram Bartholl was realised in the context of the research project “Art and Civic Media”, as part of the Innovation Incubator Lüneburg, a large EU project funded by the European Fund for Regional Development and the Germna State of Lower Saxony. “Keepalive” by Aram Bartholl (*1972 in Bremen) looks just like a normal rock from the outside. There is no sign that the stone, which lies inconspicuously in Lüneburger Heide on the edge of idyllic Hartböhn, contains hundreds of digital books. An internal thermoelectric generator and WiFi router must be activated by a lighting a fire under the rock before an electronic survival guide library can be accessed. Data and text can also be added by smartphone or laptop. Media artist Aram Bartholl works with paths of knowledge and information communication that work against the developments of the digital age and question our handling of data. In this and other projects, he undermines power structures and control mechanisms in the use of internet services and data transmission, mostly through the introduction of a random, uncontrollable element. In “Keepalive” the stone itself becomes the data medium. In a very archaic, but at the same time clandestine manner, information can be exchanged only locally — in contrast to networked servers, services and clouds worldwide, this rock is not connected to the internet. You have to get close to nature in the countryside, find the stone and make a fire to activate the data source. Anyone can do it once they have found out the exact location of the stone from either the nearby Kunstverein Springhornhof or another source. The “Keepalive” project by Aram Bartholl was created in conjunction with the research project “Art and Civic Media” as part of Innovations-Inkubators Lüneburg, a major EU project supported by the European Regional Development Fund and the State of Lower Saxony.